0 Comments Published by Jane on Monday, May 28, 2007 at 1:30 PM. On March 14, 1942, in the Atlantic ocean off the coast of Atlantic City, New Jersey Otto Von Bulow, commander of the Nazi u-boat 404 spied the merchant marine vessel LEMUEL BURROWS. He gave the order to fire the torpedoes, confirmed the hit, and noted the name of the ship and tonnage destroyed in his log book. This was his third attack of the four ships he would sink during his March patrol along the northeast coast. A successful mission that would result in the award of the Knights Cross by Hitler on October 20th, 1942. Otto told me that many of his ‘kills’ in the early part of the war were managed because the American Admiral did NOT believe that the British could teach him anything about the convoy system and protection. He also laughs as he tells me that he used to bring U404 close inshore off the coast of the USA and allow his crew on deck, to get some fresh air, watch the lights on shore and occasionally listen to music being wafted out to sea on the breeze. Lawrence T. Sullivan (pictured above) was serving as third-mate on the LEMUEL BURROWS that fateful March day in 1942. He was 42-years-old and had been sailing for most of his life. He graduated from the Massachusetts Nautical Training School (later to become Mass Maritime Academy) in 1921, obtained his pilot's license for the ports of Portland, Me., Boston, New York and Chesapeake bay and at 25 years-old was appointed captain of a steamship collier. He knew that coastline and he knew that ship (the LEMANUEL BURROWS was a collier, built in 1917), she was 7610 gross tons, and had 34 crew onboard. An old steamship carrying necessary freight up the coastline. Lawrence told his mother that it was only a matter of time before his ship was hit. He had seen the damage the uboats were inflicting on merchant marine vessels like his. He was sadly right and on March 14, 1942 twenty (Lawrence being one of the twenty) of that thirty-four member crew lost their lives when U404's torpedoes struck and sank the LEMUEL BURROWS. 3 Comments Published by Jane on Sunday, May 27, 2007 at 11:13 PM. Pictured is a page from one of the old scrapbooks I have been scanning. Unfortunately, I don't know the source of the newspaper articles, nor the date. 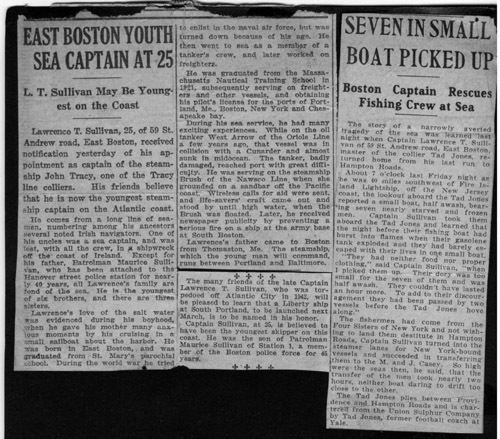 Lawrence T. Sullivan, 25, of 59 St. Andrew road, East Boston, received notification yesterday of his appointment as captain of the steamship John Tracy, one of the Tracy line colliers. His friends believe that he is now the youngest steamship captain on the Atlantic coast. He comes from a long line of seamen, numbering among his ancestors several noted Irish navigators. One of his uncles was a sea captain, and was lost, with all the crew, in a shipwreck off the coast of Ireland. Except for his father, Patrolman Maurice Sullivan, who has been attached to the Hanover street police station for nearly 40 years, all Lawrence’s family are fond of the sea. He is the youngest of six brothers, and there are three sisters. Lawrence’s love of the salt water was evidenced during his boyhood when he gave his mother many anxious moments by his cruising in a small sailboat about the harbor. He was born in East Boston, and was graduated from St. Mary’s parochial school. 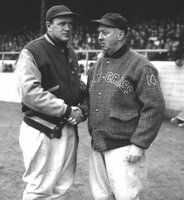 During the world war he tried to enlist in the naval air force, but was turned down because of his age. He then went to sea as a member of a tanker’s crew, and later worked on freighters. He was graduated from the Massachusetts Nautical Training School in 1921, subsequently serving on freighters and other vessels, and obtaining his pilot’s license fro the ports of Portland, Me., Boston, New York and Chesapeake bay. During his sea service, he had many exciting experiences. While on the oil tanker West Arrow of the Oriole Line a few years ago that vessel was in collision with a Cunarder and almost sunk in midocean. The tanker, badly damaged, reached port with great difficulty. He was serving on the steamship Brush of the Nawsco Line when she grounded on a sandbar off the Pacific coast. Wireless calls for aid were sent and life-savers’ craft came out and stood by until high water, when the Brush was floated. 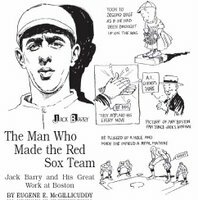 Later he received newspaper publicity by preventing a serious fire on a ship at the army base at South Boston. Lawrence’s father came to Boston from Thomaston, Me. The steamship, which the young man will command, runs between Portland and Baltimore. 0 Comments Published by Jane on Thursday, May 24, 2007 at 9:25 PM. fourth day of Jan-u-ary the wind in a gale did blow, And four & twen-ty hands were lost on the "Al-fred D. Snow." happy day she sailed away to cross the stormy foam: There's not a soul alive to-day to bring the tidings home. Thanks again to Margaret McCrea and the Thomaston, ME Historical Society for all the great information! 6 Comments Published by Jane on Wednesday, May 23, 2007 at 11:00 PM. 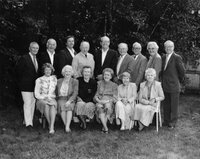 You should have been in Thomaston, Maine last September when we presented a lecture on the Alfred D. Snow at the Thomaston Historical Society, which was repeated at the Owl's Head Transportation Museum this winter. We were given a model of the Ship Alfred D. Snow, which had been crafted by a crewman aboard the vessel on a passage from Thomaston to CA. At that time Captain Willey and his family were aboard and the model was presented to the Captain's daughter, Lizzie, named in her honor. This gift prompted a research into the vessel's past and the Thomaston men, who were part of her crew. We found the houses belonging to those men, who lost their lives in the tragedy. We didn't have much information on Patrick H. Sullivan's family. According to our genealogical sources, Patrick Sullivan came from county of Waterford, Ireland; m. Jane Brady of Thomaston on Aug 18, 1851. 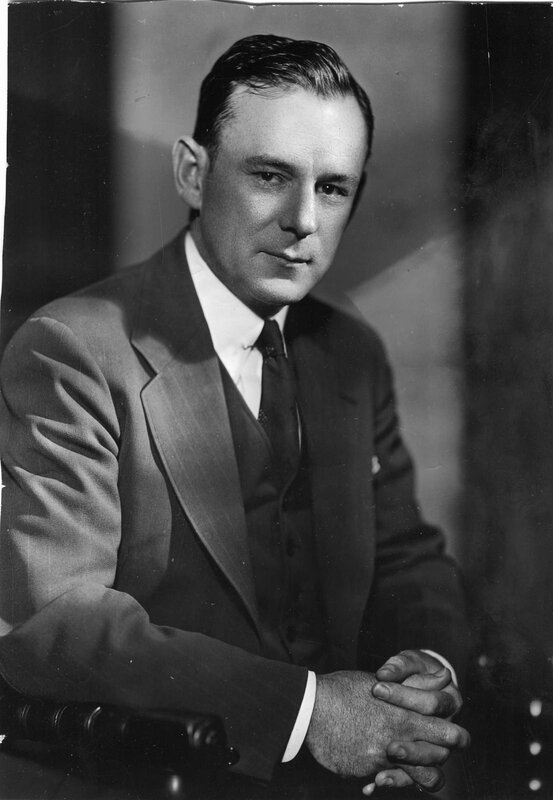 Patrick H. was the son of Patrick Sullivan. Patrick's brother, Timothy, b. abt 1810 in Ireland and his wife Ellen were in Rockland, ME (neighboring town) at the same time. Timothy died suddenly on Feb 26, 1863, but left children. 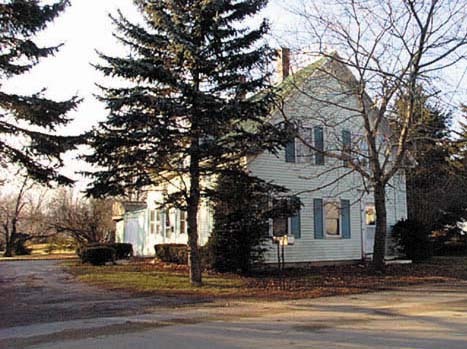 I have attached a photo of Patrick Sullivan's house, which is on the same street of Captain Willey's home. 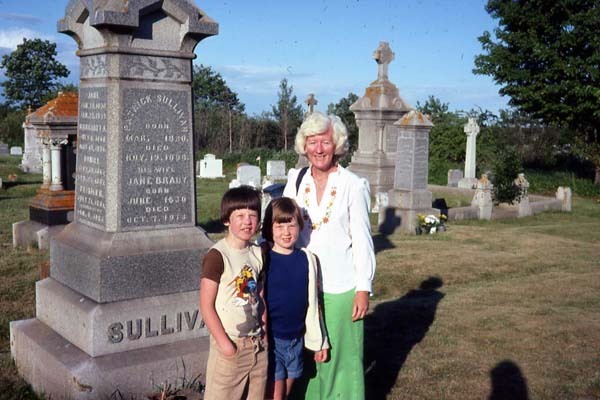 These exciting nuggets of information had me searching my scans of old slides and I came up with this image taken in 1976 or 1977 of my Mother (Suzanne Deedy) and my brother (Conal Deedy) and myself (Jane) in front of the Sullivan family gravestone (My Mother's mother was Helen Sullivan) in Thomaston, ME. This close-up of the gravestone lists Patrick Sullivan (1820-1888) and his wife, Jane Brady (1830-1913). 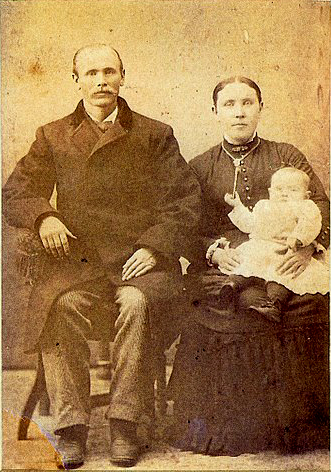 These are my great-great grandparents. 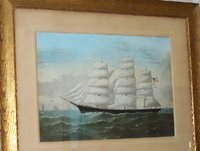 The painting that started this whole research quest has been in the family for as long as my Mother could remember, but she had been told it was the ship of an Uncle who was lost at sea. It was only as we read the articles found on the back of the painting that more details emerged. Thanks to Margaret McCrea's information I can now confidently say Patrick Sullivan on the family gravestone is the Father of P.H. Sullivan, first-mate, who died in 1888 on the shipwreck of the Alfred D. Snow on the Irish coast. The sea appears to have been both kind and cruel to my ancesters. My great-aunt Jane Austin Sullivan (daughter of Maurice Sullivan who was the brother of P.H. Sullivan) left behind some notes about her family history. They reveal that P.H. Sullivan's Father, Patrick, immigrated from Ireland with his Father and three brothers. He and two sons died of ships fever and are buried in Nova Scotia. G. Father Patrick Sullivan, after death of Father and two brothers made his way to Thomaston, ME. Stayed there working for Capt. Watts. The notes from my great-aunt continue with this: Gr. Mother Jane Brady born June 1830 died Oct. 7, 1913. She came from Ireland, June 1847 in the Brig. General Tailor commanded by Capt. 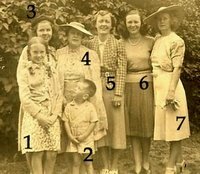 Lilly of South Warren, her Father Maurice Brady her Mother Margaret Caraway of the Town of Sligo County Sligo Ireland. Gr. Mother Jane Brady an orphan was going to be adopted by the Protestant side of the family the Cordways. The Bradys decided to send her to … The Brady’s in Maine Captain Lilly of South Warren Maine was looking for a nurse maid for his child on the voyage home. Jane came to Thomaston and lived with the Elliot’s. From these pieces of information a tale is starting to emerge. Patrick Sullivan, having survived the crossing from Ireland to Nova Scotia with his brother Timothy buried his Father and other two brothers and made his way to Thomaston, ME to work for Capt. Watts. 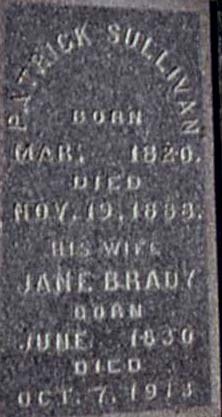 In Thomaston, ME he met and married Jane Brady, who herself survived the crossing at age 17 - paying for her passage by working as a nursemaid for Capt. Lilly. Their son, P.H. Sullivan, later found work as a sailor for Captain Willey. 6 Comments Published by Jane on at 10:26 PM. My Father found this photo taken years ago at a family gathering (maybe a wedding?) 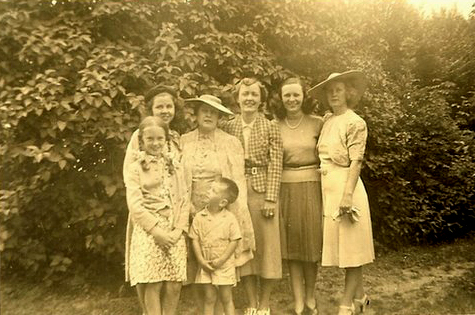 Pictured are cousins - all children of the McDonough girls. My Father did his best to identify everyone below. As always you can click on the image to see larger. If I have made a mistake please correct me in the comments! 1 Comments Published by Jane on Sunday, May 20, 2007 at 7:03 PM. Wreck of a Thomaston Ship on the Irish Coast. The Alfred D. Snow Goes Down with All on Board. Capt. Wiley's Wife One of the Victims of the Wreck. DUBLIN, Jan 5. - The vessel Alfred D. Snow was driven ashore and wrecked today, in Herryloch Bay, at Arthurstown, county Wexford. The crew were drowned. The bodies of the captain and three of the crew were recovered. London, Jan. 5. - It is now known definitely that the vessel wrecked near Waterford, Ireland, was the American ship Alfred D. Snow, Capt. Wiley, which left San Francisco Aug. 31st, for Liverpool. The ship was lost in Herrylock Bay, off Arthurstown at the entrance to Waterford Harbor. There is no doubt that every member of the crew perished. The ship's papers have been recovered. SAN FRANCISCO, Jan. 5 - The American ship Alfred D. Snow whose loss is reported from Waterford, Ireland, was one of the Nevada Bank's fleet of wheat ships. She departed for Liverpool, Aug. 3d last, having been cleared the day previous by William Dresback, the leader of the "bull" clique in the later wheat deal. The crew consisted of Capt. W.H. Wiley, first mate P.H. Sullivan, second mate John Child, and 26 seamen. Capt. Wiley's wife accompanied him on the voyage. The cargo of wheat was valued at $95,000 and insured. The Alfred D. Snow was owned by T. W. Chapman & Co., of Thomaston, Me. She cost $115,000 and was fully insured in Eastern companies. Extract from Liverpool paper given by Capt. Hodgkins Jan. 1888. Public Inquiry into the Matter to Be Made. New York, Jan. 11, 1888. A special from Waterford Lt., to the Herald says the wreck of the American ship Alfred D. Snow of Maine can be seen at low water lying on its side on the shoal. Five bodies, including that of the captain, have been recovered as they washed up in the harbor. Among the crew, according to a list found in a memorandum book in the captain's pocket, were Capt. W. J. Willey, John Willey, son of the captain, Thomas McMahon, A.H. Slack, P.H. Sullivan, John Lermond and Robert Barter, all of Maine; P.J. Ledger of New York, George F. Dornes, F.W. Firham of Connecticut, John MacDougal of Vermont. John Johnson of Chicago, James Harrison of Massachusetts, Kellogg of Michigan and James Schoaer of New York. At the opening of the inquest it appeared that the captain of the station life boat, on the morning of the wreck refused to put the boat out, on the ground that the weather was too rough, in which he was supported by a few of his crew, but the majority wished to proceed. In the port of Danmore, a short distance away, were some Manx fishing boats, whose crews insisted on taking on the life boat in spite of its captain by force, and assisted by the consenting members of the life boat's crew. They pulled ot the wreck while the storm was its fiercest, but the delays made them arrive too late to render any assistance, the crew of the Snow being one by one swept away by the waves, in the very sight of the succoring boat. The latter pulled around the wreck, but fruitlessly. The cowardly captin of the life boat is in danger of being lynched, while the Manx crew are being made heroes of. The body of Capt. Willey has been embalmed, and will be sent to Thomaston, Me. Owing to the above serious allegations, the committee of the local branch of the National Life Boat Institution held a meeting yesterday to consider the advisability of holding a public inquary in the matter, which was decided on. The funeral over the remains recovered was impressively held yesterday, and the whole town may be said to have mourned the sad fate of the strangers. The body of Capt. Willey of Maine, who was drowned by the wreck of the ship Alfred D. Snow on the Irish coast, has been embalmed and placed on board the steamer City of ?? sailed from Queen ?? The fully air conditioned Alfred D. Snow Bar at the Ocean Hotel is named after the ship Alfred D. Snow which floundered off our coast in 1888 and whose timbers were used in the original construction of the pub in 1890 where they still remain today. The walls of the bar abound with writings on the history of that ship. 0 Comments Published by Jane on Tuesday, May 08, 2007 at 10:38 AM. Once again Mary Kennedy Dean has contributed a gem of a picture. 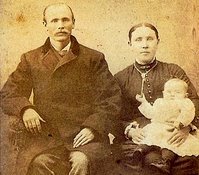 This time it is an 1880 family portrait of a young McDonough family. Mary reports that this picture was found in MaryJane's effects. Having seen the much larger and later McDonough family portrait - it is nice to see that when they had only one child the young couple look much more relaxed! Pictured are Thomas McDonough (born in Sligo, Ireland 1853) and his wife Mary Morely Loftus McDonough (born York, England 1852) with their daughter Mary McDonough (born Worcester, Massachusetts 1879). Thanks again Mary for the great contribution! 1 Comments Published by Jane on Monday, May 07, 2007 at 2:18 PM. Mary Kennedy Dean has once again been busy looking in old photo albums and has contributed another great family photo. You can click on the picture to see it larger. Hard to believe (for me) but that little boy pictured is my Dad!